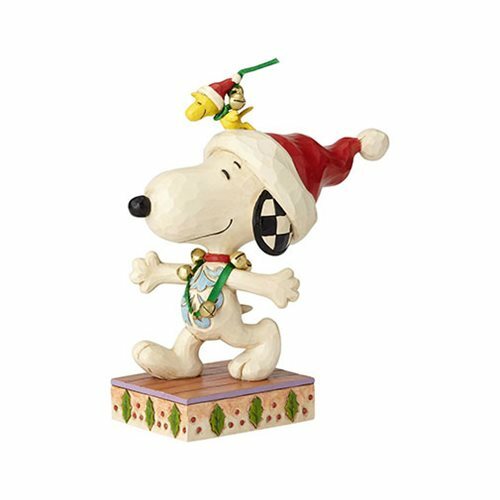 Snoopy and Woodstock are certainly strutting the Christmas spirit in this happy Peanuts Snoopy and Woodstock with Jingle Bells Statue by Jim Shore! Beloved folk artist Jim Shore teamed up with American institution Peanuts to bring you this handcrafted holiday design featuring the pair decked in festive bells and Santa caps, brimming with Christmas cheer, and ready to jingle all the way. The 6 1/4-inch tall keepsake figurine is sculpted from high-quality stone resin and hand painted for a beautiful artisanal finish you'll cherish for years to come.